The mass movements collectively dubbed The Arab Spring is one of the great achievements of 'people power' the world has seen, with only the fall of the Iron Curtain in 1989 being comparable. The nations of the Middle East, long the bastions of dictatorships, were one by one either found said dictators overthrown or so altered that the governments, in order to remain in power, were forced to acquiesce to popular demands. Tunisia, Egypt, and Libya saw the removable of longtime rulers through (mostly) peaceful means. Bahrain's monarchy barely survived only through Saudi military support. Syria is still embroiled in a particularly vicious and violent revolution with an entrenched dictatorship willing to slaughter the entire populace to remain in power. Moderate nations like Jordan were forced to make rapid changes, and even the most entrenched monarchy outside North Korea, Saudi Arabia, was cajoled into doing such shocking things as allowing their citizens to VOTE! Uprising, the new film by Fredrick Stanton focusing on the Egyptian part of the Arab Spring (the Lotus Revolution), culls footage shot by the actual protesters and interviews with the same, giving us a 'you-are-there' vantage point where the fear, anxiety, anger and hope of a long-oppressed people finally found that once fear is lost, so is the dictatorship. We start with Egypt 2011. As far as President Hosni Mubarak and his court was concerned, all was right with the world. Corruption was rampant, the police could arrest any opposition and torture them with no fear of reprisal, the people suffered and starved. Then according to the film, four elements started coming together that would eventually lead to the fall of the regime. First was said repression. The corruption of the government and their methods of holding on to power had been simmering for thirty years, ever since Mubarak gained power by succeeding the assassinated Anwar Sadat (who himself had gained power by succeeding the dead Gamel Nasser), a series of unelected Presidents. 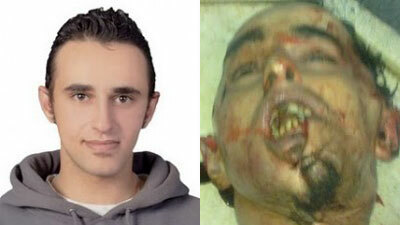 The Murder of Khaled Said. This handsome young man was not interested in politics, but in computers. He had found video of police selling drugs at the police station and had posted it on YouTube. For six months I believe they had searched for the one responsible. When they had, they killed him, out in the open, figuring no one would say anything. Surprising them, the youth did respond by making a Facebook page in his memory and soon organizing for protests. Into this mix came the fourth element: the Tunisian (or Jasmine) Revolution, which had forced their dictator from power. The Youth figured, if in Tunisia, why not Egypt? On January 25, 2011 (two days before what would have been Said's 29th birthday), they put on Facebook that they were going to protest. The response was swift: thousands upon thousands found themselves all over the cities of Alexandria, Suez, and especially Cairo. From there, Uprising puts us there in the streets of the capital, and in Tahrir Square, as the population: men, women, Muslim, Christian, liberal, conservative, the old and the young, all joined in making one simple demand: The People Want the Fall of the Regime. Mubarak responded with police, with bullets, with water cannons and tear gas, but unlike other protests and thwarted revolutions, they found that this time, the people would not be moved. The Egyptian populace was determined to stay and it would be the government who would leave. 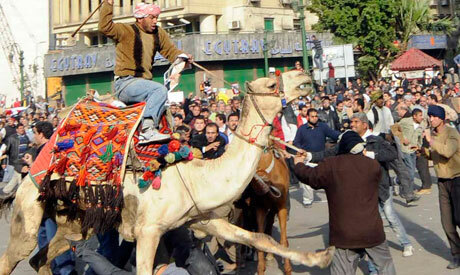 The culmination of Mubarak's determination to stay was the now legendary and bizarre sight of riders in camels and horses rushing into the crowds. The medieval image of armed riders juxtaposed with said pro-regime forces nearly burning down the Egypt Museum (home of the fable treasures of the Pharaohs) and the cutting off of Internet and cell/mobile phone use doomed the regime. By the beginning of February, Mubarak had finally been forced to resign by the army and the people had overthrown their long-hated government. Uprising's greatest attribute is in bringing us the footage shot during the tense days. It is as close as any of us will get to the actual revolution, and we see both the horror of the violence we're witnessing but also the joy of being able to speak freely. At certain points, Tahrir Square had an almost festive atmosphere, with people singing and bringing their children, almost as if this were a big spontaneous party. The film moves quickly, not taking up lots of time setting up how Egypt came to be the way it was in January 2011. This isn't a flaw in that we do get some idea of how Mubarak came to power. Also, we would naturally have to spend time figuring how Said's murder was the impetus, the trigger for lack of a better word, that unleashed the decades of pent-up anger at the injustice of the regime. Uprising, with its use of video photographed by the actual protesters, gives you an immediacy and urgency into those heady, chaotic, and terrifying days, again, as close to the action as possible. It is almost as if one is living the Lotus Revolution live as its happening. The interviews range from Arabic to flawless American English, giving us an insider's view of events both in how they came to be and in how it unfolded. From their experiences and recollections, the tales of terror and bravery are inspiring and at times, heartbreaking. It is hard to not feel emotion when a woman speaks of how the man next to her was shot at such close range that she describes it as his head exploding, with her unable to figure out what to do. We also can hear their genuine surprise that they found themselves in the middle of history, going from what they thought were peaceful protests to an actual (relatively) peaceful revolution. If I were to find fault in Uprising, it is in that it did not go as deeply into certain aspects that made the Egyptian section of the Arab Spring so unique in the Arab/Islamic world. The Coptic Christian community was important to the Lotus Revolution, even providing protection while the Muslim Egyptians were on their knees in prayer. This was not mentioned (though to its credit the appearance of the Christian community was spoken about as it was happening). The role of women in the revolution is covered only in that many women (some who wear the hijab, some who opt for a more secular look) were actually there. However, both the importance of the women and their changing role in Egyptian/Arabic society was not dealt with as much as perhaps I think it merits. However, this I'd say is a minor flaw. 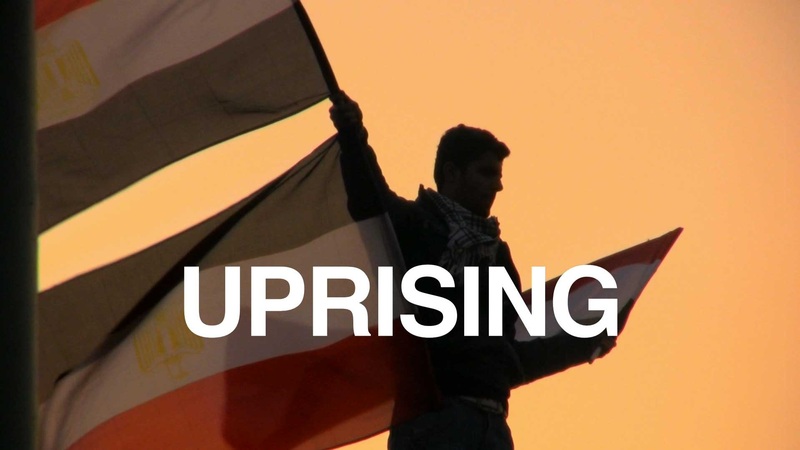 Uprising gives the viewer a glimpse into something that many held to be only a dream: an Arab, Muslim country deciding that it would embrace freedoms most of the rest of the world had long enjoyed. By allowing the participants to speak for themselves, by allowing their images to speak for themselves, Uprising will be the first great document of the Arab Spring told by those who lived to tell the tale of how they changed the course of Egypt, the Middle East, and ultimately the world. At a certain point in Uprising, we see an 80-year-old woman talk to those at Tahrir Square. She tells them (and us) that she's seen various protests since the time of King Farouk, but this is for her the greatest thing she's seen and she cheers them on. Unintentionally, here is the past bequeathing freedom of the future of their country. It is a brief but inspiring moment in a documentary that chronicles one of the great moments in human history, one that gives you a true vision of what its like to gain your freedom after decades of darkness. You have won your Freedom.